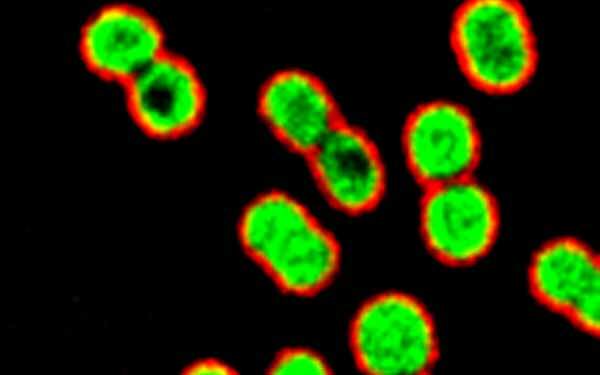 Multi-drug resistant Gram-negative rod bacteria Acinetobacter baumannii being killed by the common antibiotic azithromycin (green) in the presence of a human antimicrobial peptide naturally present at infection sites. Contrary to current medical dogma, researchers at University of California, San Diego School of Medicine and Skaggs School of Pharmacy and Pharmaceutical Sciences report that the common antibiotic azithromycin kills many multidrug-resistant bacteria very effectively — when tested under conditions that closely resemble the human body and its natural antimicrobial factors. The researchers believe the finding, published June 10 by EBioMedicine, could prompt an immediate review of the current standard of care for patients with certain so-called “superbug” infections. Azithromycin is the most often prescribed antibiotic in the United States, where short courses can cure common bacterial infections such as strep throat and sinusitis. But azithromycin, also sold commercially as Zithromax Z-Pak, is never given to patients with some of the most nefarious multidrug-resistant bacterial infections. That’s because years of testing in standard laboratory media — the nutrient broth that helps bacteria grow — concluded that azithromycin doesn’t kill these types of bacteria. The bacteria at the center of this study are Gram-negative rods, so-called due to their cell wall structure (they appear “negative” in a classic typing test known as the Gram stain) and their shape. Nizet’s team studied extremely antibiotic-resistant strains of three medically important Gram-negative rods: Pseudomonas aeruginosa, Klebsiella pneumoniae and Acinetobacter baumannii. These opportunistic pathogens rarely infect healthy people but instead strike debilitated patients in hospitals, such as those with weakened immune systems, or following trauma or surgery, sometimes with deadly consequences. The Centers for Disease Control and World Health Organization have warned that resistance is rapidly spreading in these species, and no new antibiotic candidates are on the horizon. In this study, Nizet’s team found that simply growing these Gram-negative rod bacteria in mammalian tissue culture media — the same stuff used to sustain human cells in the lab — instead of standard bacteriologic media made a huge difference in their sensitivity to azithromycin. Even more striking, the drug-resistant superbugs were completely wiped out when azithromycin was paired with the antibiotic colistin or with antimicrobial peptides produced naturally by the human body during infection. To test these promising laboratory results in a live infection system, Nizet and team moved the experiment into a mouse model of multidrug-resistant A. baumannii pneumonia. They treated the mice with a single injected dose of azithromycin at a concentration that mimics the amount typically given by IV to human patients. Twenty-four hours after infection, azithromycin-treated mice had 99 percent fewer bacteria in their lungs than untreated mice. Similarly, in mouse models of multidrug-resistant P. aeruginosa and K. pneumoniae infections, a single dose of azithromycin reduced bacterial counts by more than 10-fold. According to the authors, the study suggests that the general effectiveness of antibiotics in the decades since the discovery of penicillin has led to complacency in our approach to antibiotic evaluation. In the current era of ever-increasing antibiotic resistance, they recommend a more holistic approach that considers both the bug and the patient’s immune system. “If something this simple could be overlooked for so many years, what else might we be missing?” Nizet said. Co-authors of this study (DOI 10.1016/j.ebiom.2015.05.021) also include Leo Lin, Poochit Nonejuie, Jason Munguia, Andrew Hollands, Joshua Olson, Quang Dam, Monika Kumaraswamy, Heriberto Rivera, Ross Corriden, Mary E. Hensler, Michael D. Burkart, Joe Pogliano, and George Sakoulas, UC San Diego; and Manfred Rohde, Helmhotz Centre for Infection Research, Germany. This research was funded, in part, by the National Institutes of Health (grants HD071600, AI057153 AI052453, AR052728 and GM073898).